Stan A. Toler, pastor, author, leadership expert, general superintendent emeritus, and devoted family man, passed from this earthly life to life eternal with his Lord and Savior 18 November. Stanley Aaron Toler was born 7 November 1950 in Welch, West Virginia, a coal-mining community that was, at that time, the poorest area in the U.S. His father, William Aaron Toler, worked in the coal mines, but, seeking a better life for his family, relocated to Columbus, Ohio, and found work in construction. When Stan was just 11, his father was tragically killed in a workplace accident and Stan felt a deep sense of responsibility to be a family leader for his mother and two younger brothers. This experience shaped his life and influenced his teaching and writing over the years, especially in the areas of positive thinking and striving for excellence in life, as well as in the Church. Toler’s call to preach came at an early age and, encouraged by his pastor, he preached his first sermon in his home church at age 14. By age 17 he was pastor of a local church and went on to earn multiple degrees in higher education, saw growth and success as a pastor and church planter, served as an executive for John Maxwell’s INJOY Ministries, and established a worldwide reputation for excellence in leadership training. 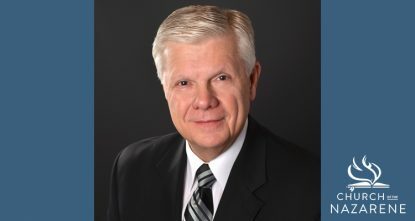 In 2009 he was elected the 39th general superintendent of the Church of the Nazarene and served in that capacity until 2013, when he was honored with general superintendent emeritus status. “Dr. Toler epitomized servant leadership in the kingdom of God,” said Gustavo A. Crocker, chair of the Board of General Superintendents. “While he aptly and faithfully led and represented the Church of the Nazarene and the global holiness family, he humbly used his gifts and talents to network the broader evangelical community for the sake of the Kingdom and to the glory of God. Over the span of 53 years in ministry, Toler preached nearly 15,000 sermons, speaking to more than 200 denominations and church groups in all 50 states of the U.S. and in 80 countries around the world; flew more than six million miles, and traveled an untold number of miles by every other conveyance available. He preached with clarity and urgency, calling people to respond to the gospel. Johnson called Toler a “consummate team player and encourager” in the roles in which they served together. “Eternity alone will reveal the awesome impact of his life through pastoral care, publishing multiple books, and generosity that met needs and glorified God,” Johnson said. After pastoring congregations in Ohio and Florida, Toler led Churches of the Nazarene in Oklahoma City, Oklahoma (Oklahoma City First 1984-1991; Oklahoma City Trinity 1997-2009) and Nashville, Tennessee (1991-1994). He was elected district superintendent for Southwest Oklahoma in 2009 shortly before being elected general superintendent. He is a graduate of Ohio Christian University (Bachelor of Theology), Southern Nazarene University (Bachelor of Arts), Florida Beacon Bible College (Master of Theology, Doctor of Divinity), and Maranatha Seminary (Doctor of Ministry). He received an honorary Doctor of Divinity from SNU in 2009. Ministry; his popular Minute Motivator series; Outstanding Leadership; and his newest release, I’ve Never Been This Old Before – The Dawn of the Middle Ages. His books have sold more than 3 million copies and leave a legacy of inspiration, encouragement, and influence for generations to come. In addition to his writing, he loved gospel music and recorded multiple projects through the years, most recently with his brothers Terry and Mark (He Still Speaks/West Virginia LIVE), performing across the U.S. as the Toler Brothers. Stan is survived by his mother, Loretta, and cherished step-father, Jack Hollingsworth; his wife of 44 years, Linda, and two married sons, Seth (Marcy) and Adam (Amanda); his five beloved grandchildren: Rhett, Davis, Wren, Clara Jane, and Bennett, who called him “Pookie” and loved him deeply. Also surviving are his dear brothers, Terry N. Toler (Sue), Mark Hollingsworth (Mary), and their families. A Celebration of Life service will be held 8 December at 2 p.m. (CST) at Bethany First Church of the Nazarene, 6789 NW 39th Expressway, Bethany, OK 73008. In lieu of flowers and to perpetuate resourcing of church leaders and pastors around the world, the family suggests honoring Stan’s memory with a donation or sending an expression of sympathy to his nonprofit ministry, Toler Leadership International, P.O. Box 720230, Oklahoma City, OK 73172 (USA).